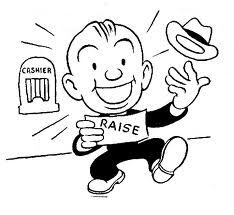 Every professional working in a company is expecting a pay raise, a promotion at some point. Most companies have such schemes, basis on years of service or even when an employee adds an academic qualification needed by the company. What happens to freelancers in this case, and especially to freelance translators, as there is no such a scheme and of course not just one employer? The reasonable answer to this question is probably the raise of the price of word. Most translators charge by the word (although, in some countries they are still getting paid based by the number of pages. I believe this method is starting to decline, as most projects are in electronic format). As time goes by and translators gain more experience it is only inevitable to wish to raise their prices. They, too, are worth to have some sort of an increase of their income. A translator who has just starting working in this market area should not change the same price per word with another translator who has 5 year experience, for instance. What can a raise in the price of word mean to a translator? In such tough financial times, a raise can mean a loss of clients. Most agencies base their profit on a low price per word that is charged by a translator. This means that if a translator charges 0.09 Euros per word, an agency will charge 0.12 Euros to make 0.03 Euros profit. The lower price per word charged by a translator, the higher the agency’s profit. So what happens when the translator decides to raise the price? The agency will make less profit, of course. It is only natural that the agency will try to find another translator that charges less. It is a risk of course, as the new translator may not match the experience and in-depth knowledge in the translation field. This is another story. It is inevitable that the translator will lose many clients and keep some of them (most based in countries that still have not faced any financial issues). To raise or not to raise? This is the question! Every action hides and has a reaction! What is the best path to follow? Keep the prices low and forget the dream of an income raise or raise the prices and hope for the best? Or even, have high prices to begin with? Please, do share your experiences on the subject! My experience is that some agencies are happy to pay what they are asked, mainly because they have clients who realise that you do not purchase specialist services on a tight budget without compromising quality. Sadly, it’s far from even half the agencies in the UK. I have raised my rates year on year, although sometimes I doubt it even kept up with inflation, let alone raise my income in line with my professional experience. Needless to say, I now do very little translation work as opposed to 10 years ago. I wish all the colleagues who enjoy working 11 hours a day just to cope with the volume of work they get at a rate of pay that works out at maybe £10 an hour in return for a university degree + highly skilled work + years of experience all the best. They are going to need it. Sometimes it is hard to decide what to do and even harder to see one by one your clients leaving.. I have been working as a freelance translator for the past five years and I have not increased my rates not even once. I was just wondering what other translators are doing. I think you have to keep your rates, maybe raise them a bit if needed, but never go below, because there is always ways forthe agency to convince the client why they need to pay a bit more than to another agency (and, precisely, is that “try to find another translator that charges less. It is a risk of course, as the new translator may not match the experience and in-depth knowledge in the translation field” that is the best reason to give to them). Thank you for your comment. I am still reluctant to do anything.. You see, a lot of “pirates” translators are all over the market in Greece. These do not have any academic qualifications; they just have a limited knowledge mainly in the English language. I, too, do not work for agencies here in Greece; they find me far too expensive as they tend to use these “pirates”. Still, I would feel sad to lose a client. I value every single one of them. Also, I do understand what you mean by saying that you will find others to love you. There are lots and lots of agencies, but I believe I have contacted them all and I do not wish to sacrifice those that I have! It is a tough matter! Thank you again for sharing your experience! I think it’s important to focus on value when raising rates. People don’t pay for value or qualifications; they pay for value. A janitor with 20 years’ experience is not going to get paid much more than one with 1 year’s experience. He or she just doesn’t offer any added value for having the extra experience. Even extra qualifications in scientific cleaning won’t help, if the client doesn’t see any value in! So, when I raise my rates, I focus on the extra value that I am delivering that justifies the rate increase. For example, you could emphasis a really valuable specialisation (annual reports) and whiz-kid abilities in specific CAT tools that saves time for the agency. Thank you very much for your comment! You are actually right in what you say! Thank you for the link, I will need to give it some thought! My experience is that when you prove that you’re a good asset to an agency, it will be willing to give you a reasonable raise regularly. I presoanlly prefer to start from a high price because it is very difficult to raise it. Thank you for your comment! Having a higher price to start with can also lead to not having enough clients.. Maybe the middle way is the best way!